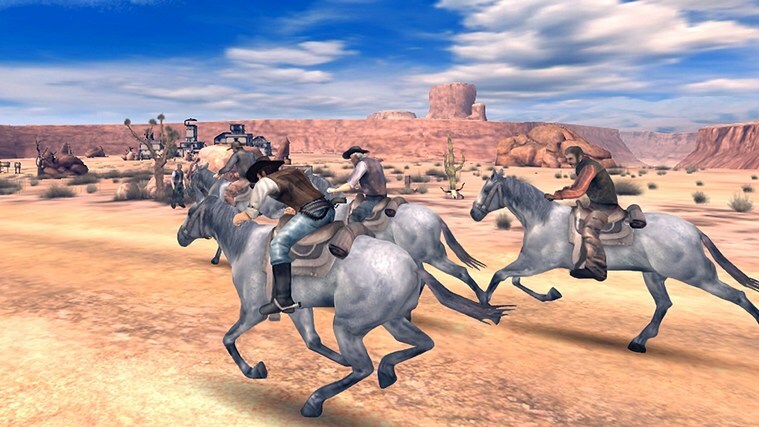 Six-Guns, a popular and not to mention free Windows Phone 8 game has made it's way onto the Windows 8 platform... also for Free! Explore a truly enormous and open Wild West frontier full of cowboys, bandits and more... unnatural enemies in this third-person-shooter adventure game. Play for free: Make your enemies pay! Buck Crosshaw never shot a man who didn't deserve it, but now he's an outlaw who had to fake his own death and escape to Arizona. But in escaping one evil, Buck is about to face another, for an ancient and wicked force stirs in the hills of this mysterious region. A WILD FRONTIER Freely explore an open world set in Arizona and Oregon full of events, mystery and challenges for you to discover as you become completely immersed in the story and the action. But don't be fooled by this land's beauty - outlaws, vampires & many other unnatural foes lurk in every shadow. ACCEPT THE CHALLENGE Take on 40 missions with a great variety of tasks for you to overcome. You'll race horses, take out robbers, fend off waves of enemies and more along the way! SADDLE UP In this kill-or-be-killed land, you'll need to unlock all 8 different horses, 19 weapons and a wide selection of clothes, ammo and other items to help you on your adventure. PLAY FOR FREE Free games have never been this deep or fun! It costs you nothing to download and play the game to the end!